The highest realisation in the July 15 Warwick and Warwick auction was the £1,652 paid for a collection of 392 liners, which had merited a description of “valuable”. It included ranges of RPs and printed and artist-drawn cards from many different lines and included several chromos. A miscellaneous 260 strong collection of shipping, estimated at £350, achieved £737. Railways also exceeded estimates, with a world collection, 300 strong, estimated £430, achieving £649. 65 British railway locos with postcard backs, together with 300 with plain backs, realised £94. A number of Kent collieries were on offer but failed to reach their reserves. 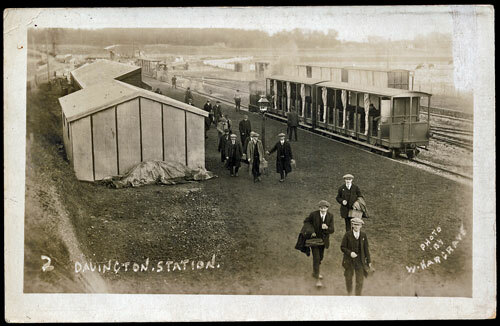 However a rare RP of Davington, near Faversham, station interior, showing 2 narrow gauge steam trains, made £65. The line was used by workers at the explosives factory and was closed at the end of WW I.
Sussex was well represented by collections. 9 collections were on offer, with estimates totalling £1,220. The total realisation was £2,551. 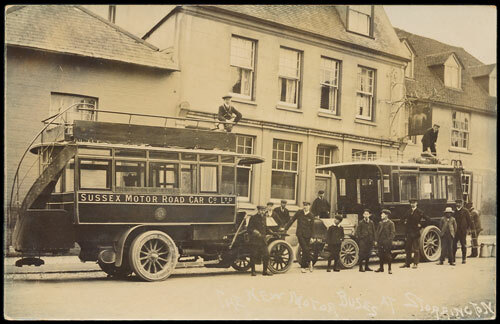 A single RP of 2 motor omnibuses and onlookers outside a Storrington pub made the impressive figure of £100. Derbyshire was represented by 2 RPs of the construction of Hayfield Dam and Kinder Reservoir, which made £50. 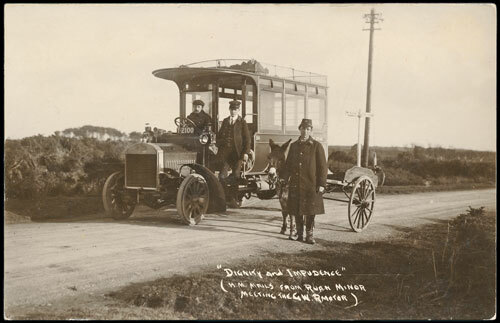 In Cornwall, the Ruan Minor postman’s donkey cart meeting the G.W.R. Helston omnibus realised £47. The subjects section of the auction was larger than usual, with good results in military art, glamour, comic, silks and animals. A collection of 230 mainly artist-drawn glamour, estimated £380, made £767 and a 520 strong collection of military art, rich in Harry Payne cards, estimated at £700, achieved £1,091. A collection of 270 Italian military art chromos, estimated £400, also made £1,091. Amongst the collections of comic cards, lot 96 was around 600 Bamforths dating from the Golden Age to the 1960s. They realised £283. 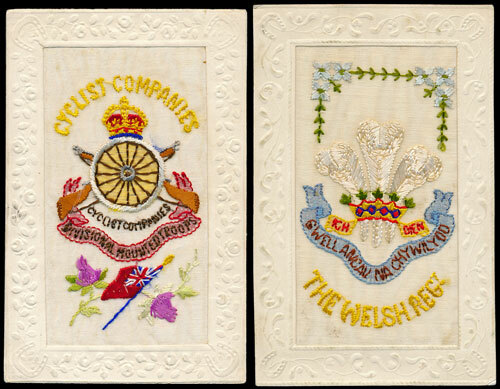 Individual embroidered silks on offer included Cyclists Companies, Divisional Mounted Troops and The Welsh Regt, both of which realised £54. An unusual collection of fox hunting cards included many appealing social history RPs. The 73 cards were estimated at £350 and realised £678. The next Warwick and Warwick postcard auction takes place at Warwick on September 16th.